Consuming green vegetables such as broccoli not only provide nutrients and vitamins essential for your body. Habits take some portion of broccoli each week may protect men appeared from prostate cancer. As reported scientists from the UK, on Wednesday (2 / 7), broccoli big potential to become cancer prevention because of the food matrix has a natural unique mechanism against cancer. Richard Mithen, biologist from the Institute of Food Research, explains, compound in broccoli may trigger genetic changes in the body to reach the hundreds. In addition, the substances in broccoli can activate the genes that are capable to fight cancer and deactivate genes that supply the tumor cell. Previous indeed a lot of research evidence that supports the importance of dietary fruits and vegetables to the risk of cancer. However, Mithen claims that the research, also published in the Public Library of Science journal PLoS One, is the first study in humans to investigate the potential and mechanism of biological processes. "Every person suggested to consume vegetables, but no one can explain why. Research is able to explain why our vegetables very well," said Mithen who led this research. Prostate cancer is now recorded as the second highest killer disease in men after lung cancer. Each year, approximately 680,000 men diagnosed in the world suffering from this disease and about 220,000 of them died. In research, along with his team Mithen involving tens of men who carry Para cancer pale that has the risk of become prostate cancer. Participants were divided in two groups, namely that obtained feed broccoli and pea group. Every Sunday for one year of this group were given four extra portions of food broccoli or pea. Experts also take the example for running a network of research and they found that men who ate broccoli showed changes in genes that plays an important role in fighting cancer. According to the researchers, the same benefits also likely to be obtained from vegetables of the Cruciferae or Brassicaceae contain isothiocyanate compound, such as cabbage kailan, flower cabbage, kale, arugula, water lettuce, and horse radish (a kind of radish). However, Mithen said, broccoli has a kind of special material which is very strong called sulforaphane, which is believed to make a vegetable-greens have the extra weapon prophylactic cancer. "When people have a cancer, a number of genes is turned off and some other active. What is done by the compound in broccoli appear to activate the genes that prevent the growth of cancer and other off the gel that makes tumor spread," said Mithen. 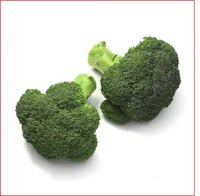 He added, broccoli eater shows 400 to 500 positive genetic changes in the body, in which men who have similar genes called GSTM1 get maximum benefit from broccoli. The half of the entire population to bring this type of genes. Researchers do not monitor more of the participants to know who ultimately suffer cancer. However, these findings support the idea that with consuming more vegetables every Sunday can provide a big change for the health. Mithen indicate that important compound in the vegetables was also likely to provide the same benefits for the other organs and can even protect from many types of cancer. "You do not need to change the diet, only need more vegetables to make a portion of a big change," he clarified.